Birth Certificates: Do You Have the Right Kind to Get a Passport? Birth certificates can be the key to getting a US passport. The most important requirement to get a first time passport, a child’s passport, or a replacement for a lost, damaged, or stolen passport is original proof of US citizenship. For most of us, that’s going to be a birth certificate. But not all birth certificates are acceptable proof of US citizenship to get a passport. Is your birth certificate the right kind? Long form birth certificates are issued by the Department of Vital Statistics in the state where you were born. Your official long form should bear a registration number and a seal. If you need to order a new copy of your birth certificate to get a passport, make sure to request a long form certificate! There are many varieties of short form birth certificates, from ones that look very much like long form certificates to small cards the size of a driver’s license. In some states, such as Texas, short forms are the default form of birth certificate and are known as “standard size.” Short form birth certificates are also often called “abstracts,” because they only provide a portion of the information included on the long form. In essence, the short form serves as proof that a full birth certificate has been filed for you. Most short form birth certificates can not be used to get a passport. In order to be used to get a US passport, your birth certificate must show your full name; gender; precise time, date, and location of birth; and your parents’ full names, dates of birth, and places of birth. Card-sized birth certificates can never be used to apply for a passport. Many hospitals will prepare charming certificates for the parents of newborn babies to take home, often with baby’s tiny footprints inked on to them. Similarly, some states also offer “heirloom” birth certificates on special paper with decorative details. These certificates are suitable for framing or scrapbooking, but are not valid proof of US citizenship to get a passport. Were you adopted as a child? You may have been issued an Amended Birth Certificate that lists your adoptive parents as if they were your biological parents. These are absolutely acceptable for passport applications. On your passport application, you will also list your adoptive parents in the spaces for your parents’ information. Did you know that the State Department also issues birth certificates? They do! If you are born outside the US to US citizen parents, you can be issued a Consular Report of Birth Abroad (Form FS-240). These are issued at the US Embassy or Consulate in the location where you were born. When you apply for a new US passport, you will need to submit the Consular Report of Birth Abroad instead of your locally-issued birth certificate. The most important thing to remember is that the birth certificate you submit with your passport application must be an original document. You can’t use a photocopy or even a notarized photocopy. In this case, “original” doesn’t mean first. It simply means that it is the official document issued by the government agency, not a photocopy or scan. It’s OK if you no longer have the first copy of your birth certificate that was issued right after you were born. 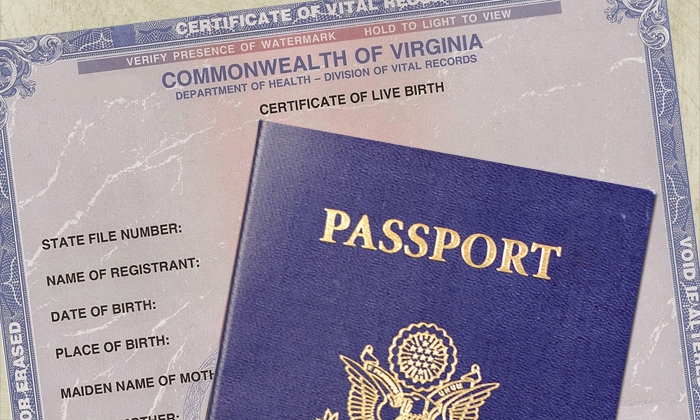 You can get a new version of your long form birth certificate from the Bureau of Vital Statistics in the state where you were born, or you can order it online from VitalChek.com. What Happens if You Don’t Have the Right Kind of Birth Certificate? Any time you have to apply for a passport using Form DS-11, you will need to go to a Passport Acceptance Facility before you send your application to G3. If you don’t have the right kind of birth certificate, the Passport Acceptance Agent will tell you. You won’t be able to have your application prepared for submission until you return with an original long form birth certificate. Not certain if your birth certificate will pass muster? We’re here to help. Just reach out to your G3 passport specialist to confirm if you have the right documentation to get your new passport.